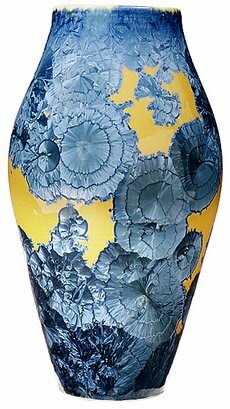 Over two hundred years ago crystals accidentally appeared on porcelain pottery in China. What was, at first seen as a mistake, is today pursued and valued. The same forces (temperature and time) that create the diamonds, rubies, and sapphires we wear as jewelry, also create the spectacular patterns and colors you see on these pieces of pottery. These pots have been fired to normal glaze temperature then lowered quickly to the crystal growing temperatures approaching 2000 degrees. The crystals start forming from minute particles of Zinc in the glaze over a 14-16 hour soak period. The colors come from the addition of various colorants that are added to the glaze. Varying the time and temperature of the soak period controls the size and shape of the crystals. 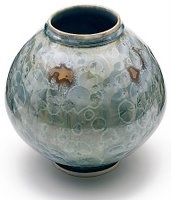 Many potters consider crystalline glazes to be the most challenging of all glazes to produce. This is because they are unusually difficult and time-consuming to formulate and fire. Crystal glazes are extremely fickle. When the glaze succeeds in capturing the luminescence of crystal formulations, it achieves a level of elegance and enchantment no other glaze can match.